I want to share some of the books I have read lately. I am fascinated by the brain and know that we live in a remarkable time of discovery about the brain. I am also particularly interested in learning more about brain illnesses (aka mental illnesses). I think many of us have been touched by mental illness in some way – whether we experience a debilitating illness, periods of anxiety or depression, or have a family member who is affected. I recently stumbled upon a book by Danielle Steel at the library called “His Bright Light.” It’s the story of her son, Nick Traina, who died of an overdose/suicide at the age of 19. These are powerful words and ones with which I agree. Caregivers have to advocate for their family members who are affected by mental illness. Go to doctor visits with them. Change doctors if necessary. Question everything. Research. Learn. So many illnesses are tied in with addictions, as well. In Nick Traina’s case, there were drugs. But were drugs being used to self-medicate? The suicide rates are very high for those who suffer from bipolar illness. The author states that 60% of those who are manic-depressive will attempt suicide and 30% will die. 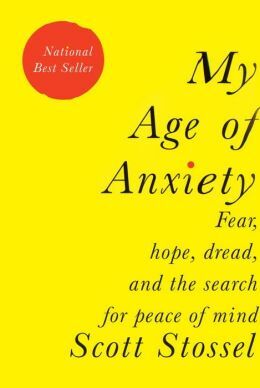 If you suffer from anxiety or know someone who does, you may enjoy Scott Stossel’s book, My Age of Anxiety: Fear, Hope Dread and the Search for Peace of Mind. The book has a wealth of information on the history of anxiety as well as current treatments. It is written by a person who suffers from anxiety and is, at times, quite hilarious! The main point to me is that there is often not a “cure” for those who suffer from anxiety. There are many methods of coping with debilitating anxiety, but it is usually something that people learn to live with. Another interesting book is Coming of Age on Zoloft by Katherine Sharpe. The author shares her account of discovering so many of her peers were on antidepressants while she was in college. She also gives a history of the illness and the drugs being used to treat it. She questions whether and how being on medicine affects one’s identity. The first two are movies, also – both very powerful. I think A Beautiful Mind has to be one of my favorite movies. It truly shows what it is like to live with a mental illness. E. Fuller Torrey’s book is also excellent. Brain illnesses have to be one of the most cruel illnesses. With as far as we have progressed in understanding them, there is still stigma associated with them. I think families should be very open about sharing mental health histories as there is an obvious DNA component to them. It is helpful to know what signs to look for so that we can reach out and support those who may encounter a debilitating illness for the first time. If you have read any interesting books on the subject of mental illness, please share them with me.